This beautiful girl is two months old. Her name is Fausia and she was born with a bilateral cleft lip and palate. Her condition was one of most severe on the patient list. Her mum is 20 years old and was quite worried about Fausia’s surgery. I explained to mum that I was born with the same condition. Her face instantly lit up. She asked the surgeon if her daughter will have a similar result as me after her surgery and he said yes. Her smile grew even more. 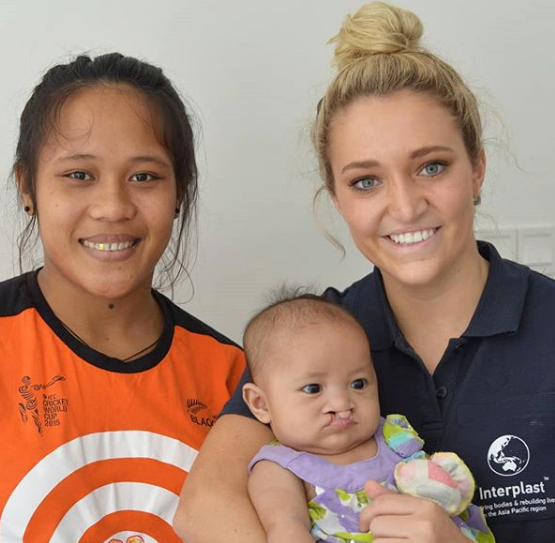 Jess Hosking stepped off the AFLW Australian footy field and into the Tupua Tamasese Meaole (TTM) Hospital with our volunteer surgical team in Samoa in 2018. Jess describes in her diary this experience of a lifetime. Our first job as we arrive at the hospital was to move the surgical equipment into the theatre. Interplast brings a lot of its own equipment and supplies, but they’re careful not to use expensive technology from home because there’s no point teaching local surgeons’ techniques that rely on specific equipment if they don’t have access to it. Instead, Interplast surgeons teach techniques with equipment that local surgeons have readily available or have been donated by Rotary or other donors. Volunteer surgeon’s Dr Ben Norris and Dr Damian Marucci start the assessment clinic which is where they meet the patients who are wanting surgery. TTM Hospital works hard to prepare for Interplast visits by conducting extensive outreach visits beforehand. Hospital staff find patients with conditions that can be treated by plastic surgeons, so the visit can have the greatest impact possible. One of the first patients of the day was a 12-year-old girl called Seeni who had a severe burn on her hand. Her injury had caused her to have webbed fingers that she couldn’t extend properly. When I asked her why she wanted surgery, she said it was because the kids at school bully her and she constantly hides her hand in her pocket. Seeni has endured years of bullying from other kids because of her webbed fingers caused by a severe burn when she was younger. Toward the end of the day, the surgeons were presented with cases they couldn’t operate on or less severe cases where the surgeons were at risk of running out of time to operate. It was hard to see the disappointment on the patients’ faces when they were told that there was nothing that could be done for them during this visit. Although I have been in many operating theatres for my own operations, today was the first time I was in a theatre observing. It was fascinating to see Damian performing the same cleft surgeries that I would have had as a child. 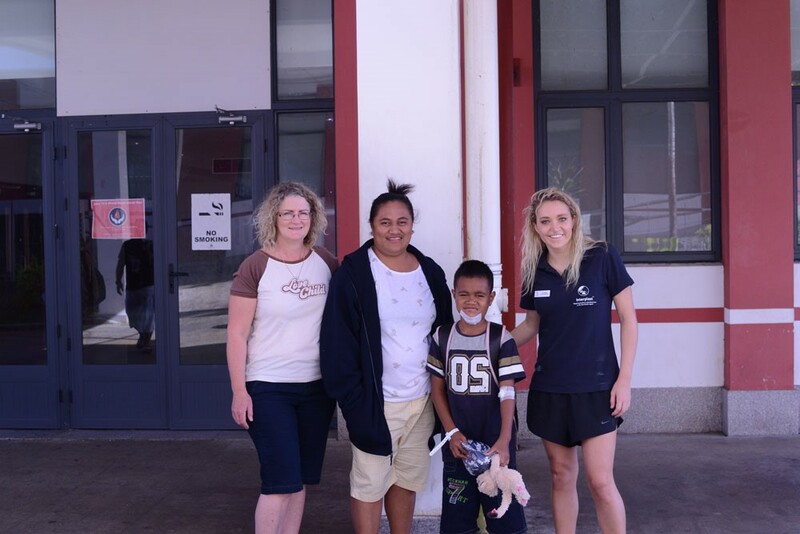 Damian’s first patient needed a cleft palate repair. The patient came in last year when the team was in Samoa and Damian repaired the lip. He explained the repair step by step. I was interested to learn the actual breakdown of a palate repair. I then watch my first cleft lip surgery. I was amazed at Damian’s precision in aligning the lip. 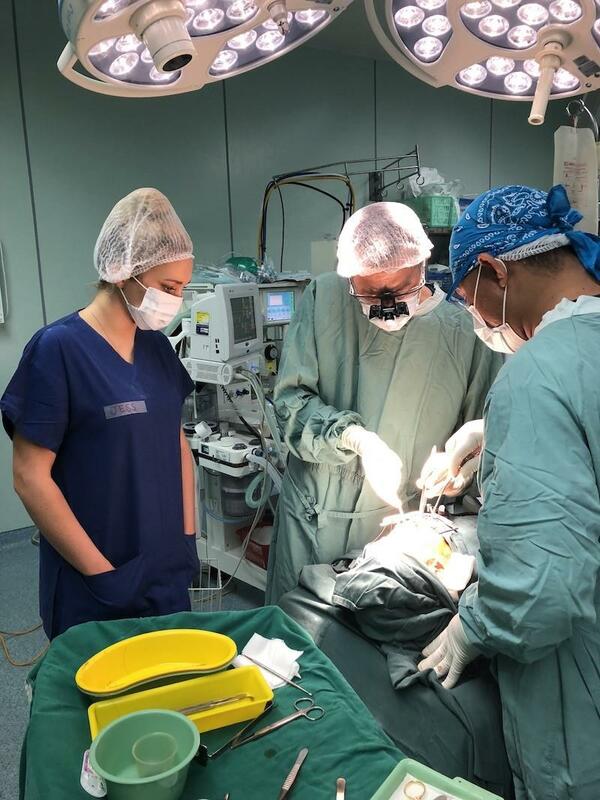 I watched Damian teach local surgeons how to repair a cleft lip, so they can hopefully learn over time to provide this important surgery when Interplast is not there. In the other theatre, Ben operated on several patients with burns, performing skin grafts and scar releases. One of these patients was Seeni who we saw in the clinic on the first day with the burns to her hand. Ben was able to take a skin graft from her forearm, separate the webbing on her fingers and recreate the hand in its normal appearance. 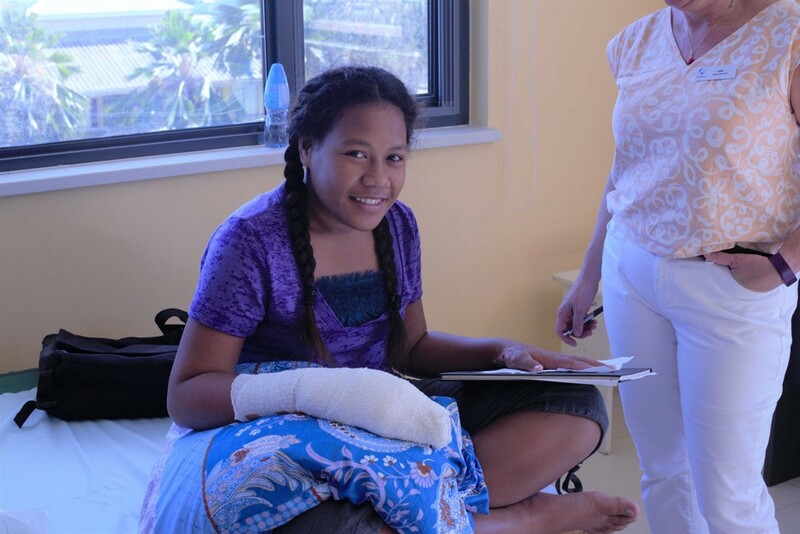 When Seeni has recovered from surgery, she will undergo hand therapy by an Interplast volunteer allied health professional to regain the use of her hand. Thanks to surgery, not only has Seeni’s hand regained its normal appearance, but she will also be able to regain use of her fingers. Ben’s last patient was a 26-year-old woman who had a kerosene lantern explode near her when she was younger, which has since affected the use of her right arm. While preparing for theatre, I could see she was in pain while the needles were being put into her arm, so I went and held her hand. She squeezed when she felt pain. Ben was able to release part of the scar tissue which allowed her to move more freely and regain better use of her arm. The amazing Interplast team completed eight surgeries today! I couldn’t get to sleep until 1am as I still had so much adrenaline rushing from watching all the surgeries. As we were walking into the hospital we bumped into Tilly, a young boy who had a growth on his chin which was removed by Damian yesterday. He had a big heart-warming smile for us. I then went into the physiotherapist room with Interplast volunteer physio, Katie Anjou, and I met Matthew, a local physio. Katie was teaching Matthew how to make splints for hand therapy patients, including Seeni. 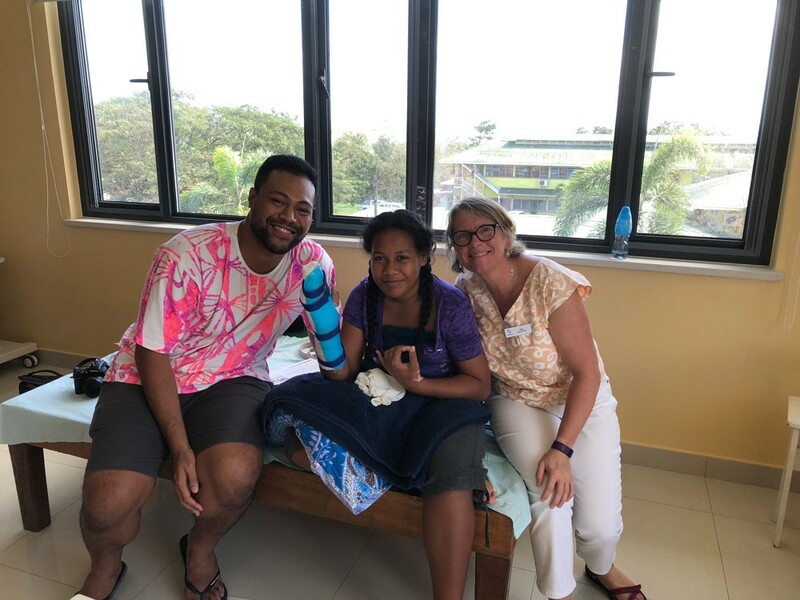 Local physio, Matthew (left) is now equipped to teach other local allied health professionals how to make and use splints as part of providing hand therapy, thanks to volunteer physios like Katie (right). Seeni (centre) is looking forward to regaining the use of her right hand again. The next patient was a lively five-year-old girl called Olivian. Her hand was burned by hot water in a household accident when she was only one year old. She had a skin graft in 2015. Her fingers were so badly contracted because of the scarring, that she was not able to form a grip with her hand. Today, Ben released her fingers in surgery. Now she needs to undergo hand therapy to regain the use of her hand. She was the most energetic person I had seen post-surgery. I helped to keep her arm still by entertaining her with Snapchat filters. It worked! Back into Ben’s operating room, I watched him operate on a man with cancer spots on his face. The scar ran from his eye and zig-zagged all the way down to his chin. 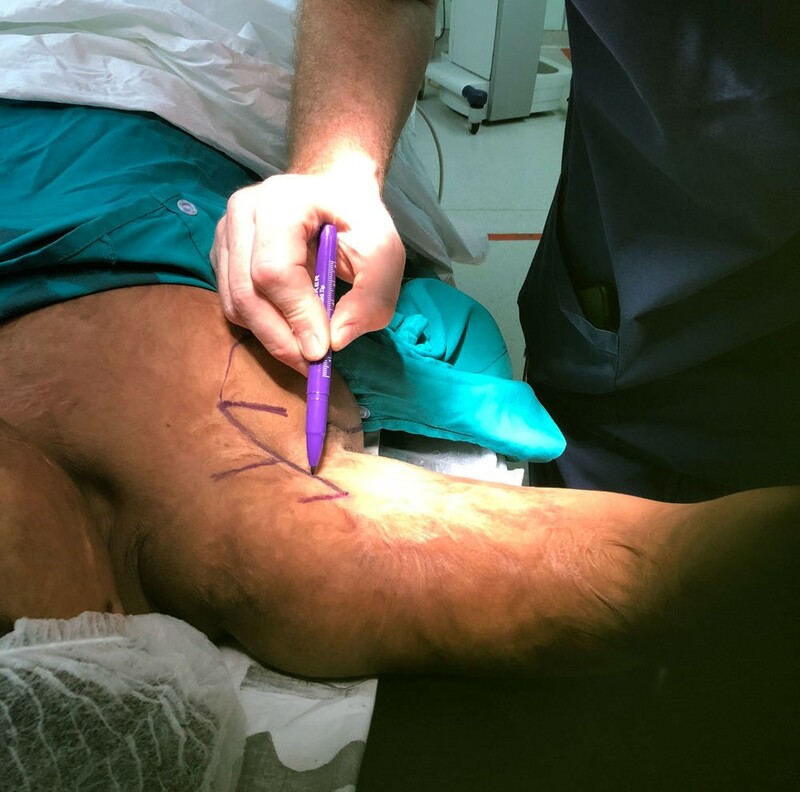 Just as Ben was finishing the surgery, he found another cancer spot and had to cut it out and perform an unplanned skin graft from the collarbone. As I reflect on the past three days with the Interplast team in Samoa, the overall experience in theatre has been incredible. I have learnt so much by meeting the Interplast team, local staff, the patients and their families. After witnessing the impact Interplast has had in only three days, I am considering a career path in the medical industry.